Okay. Here’s the part where we haul ourselves through the deep end of the pool, climb out on the other side, walk through the parking lot and into that copse of trees where we find all the rest of the UFO believers, conspiracy theorists, culties and celebrity cancer cure floggers. So, from whence came the colours of the rainbow? Man’s obsession with the number seven holds the greatest culpability. 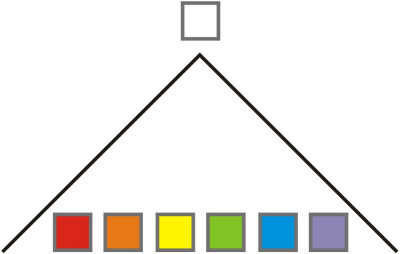 Roy G. Biv, the mneumonic who we in the west are familiar with, owes his name to Isaac Newton. 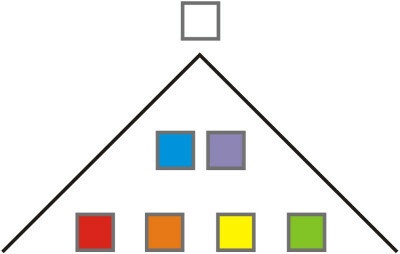 Though the idea didn’t originate with him, Newton wanted seven primary colours, and so force fit the rainbow into his schema. 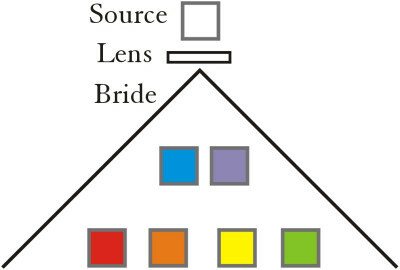 Actually, a rainbow isn’t divided into colours at all, it is a fully blended spectra. It is the limitations of the human eye that cause us to see the banding. 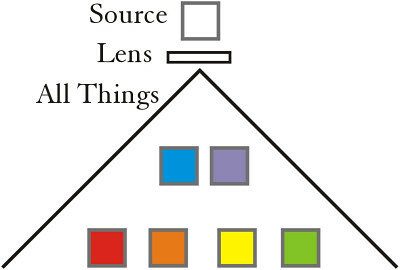 But, as has been said in this spot earlier, order is derived from the perception of the viewer. And I think Newton’s seven was a good launch point. If you have read The Glory of Kings , you know that this seven is first divided into 6 and 1. And here is where Newton got it wrong — he stuck indigo into the mix, making seven colours. It is then further divided into 4, 2 and 1. I’m not explaining this so if you are lost, then make me a dollar, buy the book and read it. Interestingly enough, the angle of incidence, the angle necessary to view a primary rainbow, is 42°. Coincidence? I think not! Why does the bill say, Out of Many, One? And, New Order of the Ages? And how can we ignore The Great Seal? This, however, is a topic we will leave off because it is easy to quickly segue from one committed to one who should be committed. This is a visual representation of faith. 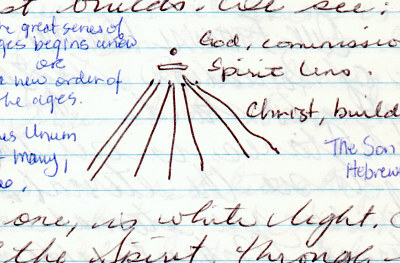 What I mean is, if the process of faith is recorded as a diagram, this is what it looks like. Faith brings man into Oneness with God. That is why the American dollar bill states, Out of Many, One. 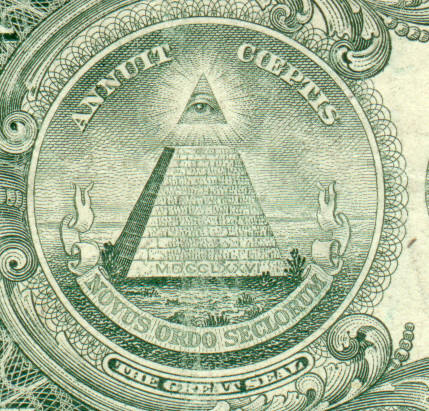 New Age belief ascribes a transfer of power through a pyramidal shape. Biblically we are told that faith is a conduit through which we can receive the power of God. The ancient Egyptians saw the pyramid as a pathway into the afterlife. The Bible declares that we receive eternal life through faith. There is power in graphic representation. You can use it to help verify theory. 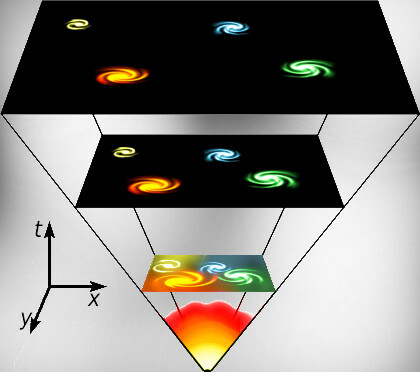 This doesn’t mean that the Big Bang is correct, but it has passed initial verification. By faith Abraham dwelt as a stranger in a land of promise, looking for a city that has foundations, whose architect and builder is God. A pyramid fits the description of this city, which is also known as the bride; a city built by faith. Well, next post we’ll tie this all back to the beginning and then quickly leave the building so the nice men in the white coats can’t find us.